XMAS | WHAT'S ON MY LIST? Happy December the 1st! We can now officially get excited about Christmas without those who're less enthusiastic about "the most wonderful time of the year" saying it's too early! Yup, on Saturday evening my housemates and I definitely made minced pies whilst listening to Christmas tunes... and we may have even watched Elf last night... it's never too early! I actually struggled with my Christmas list this year... my Mum has been asking me for one for at least a month but as excited as I am I just haven't had the time to browse the internet looking for things I may want or need in the coming year. 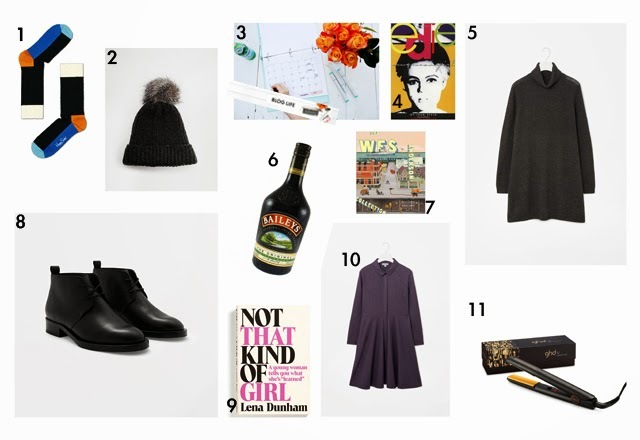 I finally managed to compose a small but sweet list consisting of a few fashion bits, some books and of course, a bottle of Baileys... here it goes! So excited to receive 'Not that kind of girl' this Christmas too! Great list. Thanks for sharing and Happy Tuesday.